I'm here today to tell you about something important. It's about my Diet Coke habit. Apparently Diet Coke isn't the healthiest for you or something like that. And I drink a decent amount of it--at least one a day. So when my fellow junkie Victoria left, I decided maybe I would cut back my DC consumption. I had about 8 Diet Cokes in the fridge, and I decided that those would be my last 8. And then I realized that was impossible. So instead, I decided that I would still drink Diet Coke out at restaurants, but I would stop buying 12 packs of it. Good for my health--because I'll be drinking more water. Good for my bank account--because I'll buy less. And kind of good for the environment--because I'll recycle less cans. How long do you think I lasted? I ran out of Diet Coke Sunday. Guesses? That would be about 12 hours. Monday I went to the grocery store, committed to not buying more. And technically I didn't. I bought these lil guys. A 7.5 ounce sorry excuse for a Diet Coke. But it was an 8 pack and not a 12 pack so I'm not really breaking my rule. Right? 7.5 ounces is juuust enough to cut my craving and make me stop thinking about it. As I sipped my tiny Diet Coke last night, I started singing Madonna's "This Used to be My Playground." In that moment, I connected with Rosie and Madonna and their love for baseball--I knew how it felt to have the thing you loved taken away from you. Seriously, that's what I was thinking. And then I remembered that the music video to that song was a bull fight (I think?) and I got confused. And then I sang some more songs from "A League of Their Own" and Sol ignored me. Anyways... there are 5 more of those lil buddies in the fridge, and I'll keep you posted about how things go after that. I'm going to try real hard not to buy more. 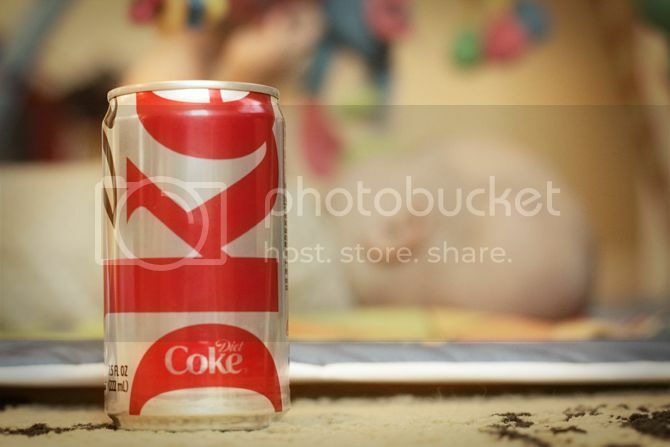 You can follow my progress using #dietcokediaries on Twitter. Because I know that how much Diet Coke I drink is of great concern to a great number of people. You are hilarious, by the way. I'm with Jenae. I have the same problem. The dilemma is WHAT am I going to drink all day? I'm already putting away at least 64 ounces of water. my sisters and I grew up quoting that movie (and still do). my favorite...this is our daughter Dottie. This is our other daughter, Dottie's sister. Shoulda just had you and bought a dog! Or, "hey cow girls, see the grass? Don't eat it." And at least you do diet...it's 1030am and I have a large sonic coke on my counter. yum. 7.5 oz? Who is that made for - elves?